With colossal potency levels of 22% THC and incredible flavors it´s no wonder Girl Scout Cookies is one of the most popular marijuana strains available on the planet today. 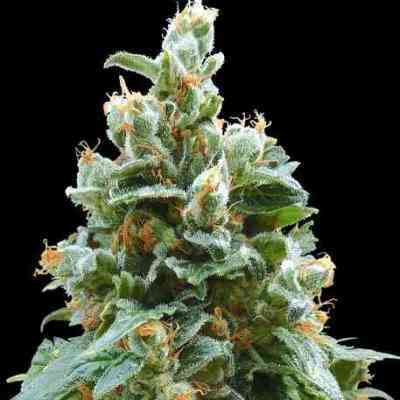 OG Kush and Durban Poison combine to create this compelling Indica dominant plant that features compact resinous buds that nessle amidst purple tinged leaves. Whether grown indoor or outdoor she adapts so easily that even the novice grower will achieve great results. And you won't have to wait long as indoors she will be finished after 70 days of flowering, whilst outdoors you´ll be reaping this potent mouthwatering headstash early October. And boy what a bountiful harvest she'll bring 500 gr m2 indoor and when grown outside 700 gr per plant. With a spicy and fruity flavor the effect from Girl Scout Cookies is well balanced starting with a rapturous high which will evolve into a floaty dreamy state of well being and pure relaxation. Pain and depression disolve quickly away and sufferers of nausea and eating disorders will also discover the benefits of GSC. Not only is this strain one of the hottest currently around but also, as the name suggests, she´s also one of the sweetest. Cure and store yours safely – Everybody wants to dip their hand in the Girl Scout Cookies jar!